Presented by Dominic Ford, Hannah Critchlow. We hear from the astronomers who are mapping out the Milky Way to work out where its stars came from. - What links Anorexia and Autism? What links Anorexia and Autism? Hannah - So, this is a study that's been published by a group of Cambridge researchers based at the Autism Research Centre. So, Simon Baron-Cohen who's Director and Professor of that unit has been looking at anorexia which actually affects 1 in 10 people in the UK. It's the food disorder where people might starve themselves and it can actually in 30% of cases, lead to death because of clinical conditions that may, for example cause organ failure. Very little is known about the biological basis of anorexia, but Simon was interested in some of the facets of anorexia. So, this compulsion to control what you're eating and also, to really kind of control and regime different aspects of your life. He thought that might be similar to autism which is a typically very male syndrome. So, he analysed 66 adolescent girls aged between 12 and 18 who had been diagnosed with anorexia, but without a diagnosis of autism and he looked at different aspects of their behaviour using different paradigms called the autism spectrum quotient and also the systemising quotient and their empathy quotient. So, this is basically just asking them to report on different aspects of their behaviour. So for example, how much they systemise different aspects of their life and also, how much they feel and respond to other people in their environment. So, it's quite a subjective analysis. He found that there was huge similarities between girls with anorexia and people that have been diagnosed with autism. Now, this is really interesting because the majority of people that are typically diagnosed with autism are male. So possibly, the people with anorexia have a certain degree of autism and this could affect the way that they're being treated in terms of therapy. Dominic - Now, autism is a spectrum of conditions going right from quite mild cases to really severe cases where children can't even speak. Is Baron-Cohen talking here about severe autism or mild cases? Hannah - So yeah, as you mention, autism can involve a triad of impairments. So, that's problems with social interaction, communication, and also, imagination. There's a big spectrum of severity that these triad of impairments can actually take in a person with autism, but Simon Baron-Cohen is really looking at the mild end of autism and comparing them with people with anorexia. Something that people commonly associate with autism is this systemising, so kind of controlling play. So for example, playing with train tracks and putting things in a particular order and that's something that you also see with anorexia - kind of controlling the meals, the food that they eat. So, there's a commonality there between the two disorders and realising that and understanding that may lead to new treatments for girls and males with anorexia. 04:08 - Is global warming just about CO2? Is global warming just about CO2? Dominic - Now, a paper which really caught my eye came out in the journal of Climate this week, looking at the environmental impact of chlorofluorocarbons or CFCs. 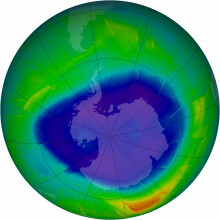 Now, if you were following the news about 25 years ago, you may remember hearing quite a lot about the damaging effect that CFCs have on a layer of the atmosphere called the ozone layer, which is a layer of the atmosphere in the stratosphere which is opaque to the sun's ultraviolet radiation. 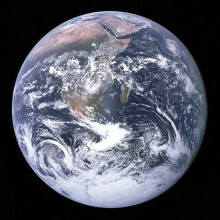 It means that we on the surface of the earth are exposed to much less of this damaging radiation. So, it makes it possible to go sunbathing without getting sunburnt. Potentially in the past, might actually have made life possible by making sure that complex chemistry needed for life was able to occur without being broken apart by those ultraviolet rays. Hannah - And I remember when I was a child that the refrigerators suddenly, they weren't allowed to emit these CFCs that were damaging the ozone layer. There was a big call to make sure that refrigerators complied with the new CFC legislation. Dominic - That's right. What happened in 1980s was that people realised that CFCs were used as a refrigerant in fridges in people's homes. In 1987, the Montreal Treaty banned the use of those because they had this damaging environmental impact. That was ratified by 200 countries, although it has taken a very long time for the CFCs that had already been emitted in the atmosphere to breakdown. Now this is often held up as being a great triumph of international legislation in solving environmental problems. But what this paper in the journal Climate is saying this week is that CFCs are also really very strong greenhouse gases. Now, we hear about CO2, carbon dioxide and the effect that that has in causing global warming. But CFCs are actually 10,000 times more powerful as a greenhouse gas than CO2. And so, what this paper is saying is that because we had this spike of CFCs in the atmosphere in the 1980s, that was causing a strong greenhouse effect historically, and over the past 20 years or so, that's tailed off. So in fact, the global warming that may have been caused by carbon dioxide in the last 20 years, we may not have seen the effect of that in full because it's been offset by this diminishment in the number of CFCs in the atmosphere. So, the argument is really that we mustn't just look at carbon dioxide,we need to look at the full suite of molecules that can cause global warming to really understand the effect that these gases can have. Hannah - So, there's no cause to celebrate yet about decreasing CO2 levels because actually, we're measuring CFC effects on global warming. Dominic - That's right. I mean, in the 1980s, we has this wonderful success with the Montreal Treaty that really does seem to have solve the problem with CFCs, we haven't had a similar treaty with carbon dioxide, the Kyoto protocol was not ratified in the end. The data is extremely complicated to analyse because there's all of these different molecules, all causing the greenhouse effect and it's not just carbon dioxide. This week the world’s first lab grown beef burger was cooked and eaten in London. But how was it made and why is it important? This week, the world's first lab grown beef burger was cooked and eaten in London. But how was it made, and why is it important? Here's this week's Quickfire science. - 70% of the world's farmland is used to grow crops to feed livestock. Lab grown meat would free up some of this land to grow food to feed humans directly. - Beef, in particular, is very bad for the environment- livestock account for nearly 20% of greenhouse gas emissions- more than all forms of transport put together, because they produce large amounts of methane. - Meat has a carbon footprint at the checkout of 17kg of carbon dioxide equivalent per kilogram- cultured meat could be significantly less. - To make the artificial burger, scientists extracted a special kind of stem cell from the muscle of cows. These 'satellite cells' are the same cells that help your muscles heal themselves when damaged. - These cells are then grown in a nutrient-rich medium- they multiply many times, so one cell can become many millions. - They are then attached to a scaffold, and stretched to increase their size- just like an animal doing exercise. - Currently, the growing medium is derived from cow blood, but the hope is that a plant or micro-organism based medium will replace it in the long run. - To prepare the burger, the tiny strips of muscle were then minced, seasoned, and shaped. - Beetroot juice was added for colouring, as there is no blood in the burger. - Taste testers said the burger had a meaty texture, but was a little bland in taste. 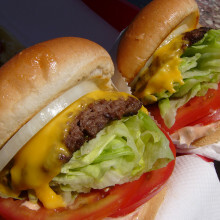 - Scientists think that cultured burgers could be on our shelves within 20 years. - In theory, burgers can be made from any animal that has stem cells, so we could even be eating penguin or lion burgers in the future! 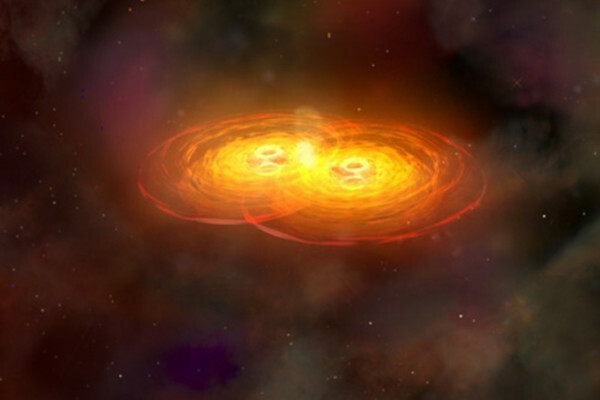 09:11 - What happens when neutron stars collide? Flashes of gamma-ray radiation in the sky have puzzled astronomers for decades, but some may be caused by collisions between neutron stars. What happens when neutron stars collide?
' 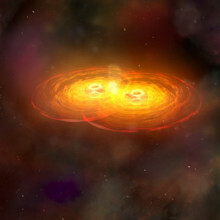 alt='Artists illustration of a gamma ray burst' >but often fade again within a few seconds. Even though they were first seen over 40 years ago, there's still a hot debate among astronomers as to what causes them. But, writing in Nature this week, Professor Nial Tanvir from the University of Leicester thinks he's found strong evidence that at least some bursts are triggered by collisions between neutron stars or black holes. Nial - So, gamma ray bursts were discovered in the 1960s in fact by military satellites which has been put into orbit to look for Clandestine Nuclear Explosions which might be being conducted in space. Instead of seeing any of those, they detected flashes of gamma rays, high energy radiation coming from somewhere - as far as they knew - beyond the solar system. What we have subsequently found out about them is that they're coming in fact from other galaxies and it seems that there are a number of different kinds of very high energy powerful mechanisms which can give rise to these flashes of gamma rays. Dominic - And how are we going about observing them? Is this basically geiger counters encounters in space? Nial - That's pretty good description actually. So, the light in the form of these gamma rays, because they're high energy kinds of radiation, the photons of light, the little particles of light act really more or less like particles that you might get of a radioactive substance. And so, if you put a detector on a spacecraft to detect these things then indeed, they detected each individual photon as they arrive. Now, the tricky thing what that kind of technology of course, is trying to tell where the gamma rays are coming from because you don't tend to get very good directional information. You tend to just sort register that the photon has arrived. So, there has to be a whole sort of sequence of trying to use other telescopes to refine the position until eventually, we nail the exact location of each gamma ray burst that we're interested in. Dominic - In Nature this week, you were talking about observations of one particular gamma ray burst that you saw back in June. What was surprising about that I gather was that it faded so very quickly after it initially flared up. What was the surprise there for you? Nial - This was a so-called short duration gamma ray burst. One of the things we've learned after all these decades of research is that gamma ray bursts come in a number of different types, which we believe have really quite different origins even though they look rather similar to each other. And so, the short duration bursts, the initial flash of gamma rays only last probably less than a second and that was the case with this one that happened in June. After that, although it was quite a bright burst, it did fade very rapidly. So, following the initial flash of gamma rays, what we tend to see with all gamma ray bursts is a slowly declining sort of ember of light that we call the afterglow, and we see that actually in different kinds of light including optical and infrared, and radio and x-rays, or basically the whole electromagnetic spectrum. In this case, the afterglow faded away apparently very quickly, and that's not too surprising. It's within the range of behaviour that we often see. But what was special was that we observed the location of the gamma ray burst again after about 9 days with the Hubble Space Telescope. Given how fast the afterglow had been fading, we, in a sense expected not to see anything at that point. But in fact, in the infrared pictures we took with the Hubble, we did see some light still there. Of course, we had anticipated this might be the case because people had speculated that the process that produces the short duration gamma ray bursts might also produce a sort of long lived radioactive afterglow as well, in addition to the normal afterglow, something that we call a kilonova. Dominic - So, how must we know about what's actually causing these flashes in the sky? Nial - The gamma ray bursts that we see have - as I say - a number of different subcategories and the ones that we see most often are what we call 'long duration gamma ray bursts' and they seem to be produced by some kind of core collapse supernova. Now, what that is, is a massive star at the end of its life. It runs out of fuel and so, gravity just starts to work on it and in a very short space and time, the whole thing collapses. And it seems that in the process of doing that in some cases, it produces a jet of material that as the star is collapsing, this jet thrusts its way out after extraordinary velocities, very close to the speed of light. If we happen to be looking down the axis of that jet then we see this flash and that is your long duration gamma ray burst. Now, in the case of the short duration gamma ray bursts that we're talking about now, the mechanism we think is they were quite different and there, we think again, we do have a jet, but it's created by the coalescence - the merging of two so-called neutron stars. So, neutron stars are incredibly dense objects. In fact, they're formed as the remnants of other kind of supernova explosion. With a neutron star, you have essentially something like the mass of the sun, compressed into a ball about the size of a town, just a few miles across that is to say. So, you've got an incredibly dense object, the densest objects we know of in the universe apart from black holes and the idea is that if you have two neutron stars in orbit around each other then their orbits gradually decay until eventually the two things crash into each other. And that can release an enormous amount of energy. Again, by mechanisms that we really don't understand well at all, it seems that that can produce a super fast jet material, producing in this case, a short duration gamma ray burst. Dominic - So, is the idea that this gamma ray burst has a very short duration because you've got two very compact objects, they're merging very quickly, perhaps forming a black hole which is very rapidly absorbing any material that might form an afterglow. Nial - That's more or less exactly right. So, the natural timescales for that final, sort of merging event is really very short, much less than a second in fact. And so, the whole process, the energy release happens really quickly and so, that then seems plausible that that results in the short duration flash. The extra ingredient that really has come out of the new observations is this kilonova light and what that is thought to be produced by is that as these two neutron stars are undergoing their final death spiral as they come in towards each other, a certain amount of the material of them is thrown out into space. It's sort of ripped off each of the stars, thrown out into space, and because it's a super dense form of matter, once it's away from the neutron star itself, this fairly small percentage of the total mass of the star. But once it's ripped out of the neutron star, it expands very rapidly and forms this sort of radioactive ball of materials and it's the radioactivity from that material that was thrown out that gives rise we believe, to the later time emission after 9 days or so. One of the really interesting possibilities that's opened up by the discovery of this kilonova is, there's been a long standing mystery as to the origin of certain elements in the universe, particularly what we call heavy elements, ones with big heavy atoms. And that includes certainly very well known familiar elements such as gold and platinum. Those are elements which we haven't really got an explanation for why they exist in the universe, and it's long been thought that they might be made in supernovae. On the other hand, that turns out to be quite difficult whereas merging neutron stars of the type that I've described, look exactly the sort of place where such elements should be made in abundance. So, it may be that all of the, say, the gold in your jewellery had its origin at an event like this, that pre-dated the formation of the solar system somewhere nearby in our galaxy where two new front stars merged, sprayed a quantity of these heavier elements out into gas clouds of the Milky Way, which subsequently collapsed and formed the solar system and the earth, and everything that we see today. on the breath, a by-product of fat metabolism. 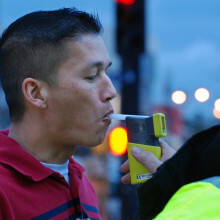 The researchers suggest that the breathalyser could be particularly useful for adjusting diet programmes for individuals, depending on how much or little fat they burn under a given diet and exercise regime. Acetone is also produced by people with diabetes, which could allow the breathalyser to help them control their sugar levels. 's research laboratories in Yokosuka have invented a device capable of measuring acetone on the breath. It also takes account of other volatile compounds that can interfere with the measurement, such as ethanol, hydrogen and water vapour. The cigarette packet-sized instrument is made up of two semiconductor gas sensors, one based on platinum-doped tungsten oxide, sensitive to acetone, and the other made from tin oxide, which detects the other volatiles to correct for potential bias. In a semiconductor sensor, the gas adsorbs to the surface and modifies the conductivity, with different formulations of the semiconductor behaving differently depending on the particular gas present. Dominic - Now Hannah, I hear toilets have been on your mind this week. Hannah - Toilets are always on my mind, Dominic, as they are on everybody's mind, everybody uses a toilet, every day, I would assume. Now, the Japanese company Lixil have produced a particular toilet called the Satis toilet which is very satisfactory for its customers usually. Now, it's got a range of different applications for this toilet and different kind of modularities. So for example, you can press a button and some nice soothing music will come out as you relax and do your business or you can even use different functionalities. So for example, you can have a deep cleanser or a more relaxing light cleanser in your B-day functionality of your toilet. Now, these Satis toilets actually retail for 3,800 pounds. That's about $5,500 and they're just available in Japan. Dominic - There's a problem, I gather. Hannah - There is a problem and this has been reported on the BBC News recently. So, the Japanese love their technology and usually, you can actually automate all of these different music, fragrance releasing and cleansing programmes within your Satis toilet, just using your Smartphone app. So, at a swipe of a button, you can turn certain things on or off as you do your business. Now unfortunately, the pre-programmed security preset for this application is '0000' and the majority of customers haven't changed that preset which means that neighbours have been going in and causing flushing and inspirational water release in the B-day system for their unexpectant neighbours whilst they're sitting on a toilet or doing other business, or anything. So basically, the toilets are being controlled by hackers. Dominic - Could be quite a surprise at the wrong moment, I guess. Hannah - Exactly, it could be a surprise at the wrong moment. So, not a great thing. This story is quite entertaining in some ways, but I think what it really highlights is that for example, in telephone hacking, so this has been happening in the last couple of years, there has been journalists that have been able to hack into people's telephones. That's for the same reason that there's this preset security code that the majority of people don't change. It's important that people have high security pass codes for banking for example or telephones and then maybe low security passwords for their toilet facilities. And don't just use your date of birth or something that could be guessed from anyone that gets information on lifestyle questionnaires for example or from your local supermarket, but try to use more complicated and less obvious security pass codes. Dominic - We're all told when we're picking passwords for computers or pin numbers for the bank that we need a very secure code. How common is it that these systems to be hacked by insecure codes? Hannah - It really easily can happen to people. This isn't the first time that this particular thing has happened with this kind of preset '0000' security code. So, in the 1960s, apparently, there's been various reports that the USA set the unlock code for their missiles, their nuclear missiles as 4 times zero, in order to prevent slowing down the release of nuclear if they were suddenly attacked. Now fortunately, they weren't hacked. So, this kind of thing can happen and just be careful really. Dominic - And I guess there's also a responsibility there for companies like banks to make sure that we're using secure codes. 24:02 - How does heat sensitive paint work? How does heat sensitive paint work? Dominic - I think the mugs that Tad is thinking of, they tend to be black at one temperature and then underneath that black ink, they've got a picture which is revealed at certain temperatures when that black ink becomes transparent. The way that black ink works, it's a black dye which is mixed with crystals of a salt which is either very acidic or very alkaline, and that paint is actually pH sensitive. It's sensitive to whether the environment is acid or alkaline. As the temperature changes, that material melts and it mixes with the dye. That actually changes the optical properties of that dye and changes it from being very opaque black paint to being completely transparent. So, it's all governed by the melting temperature of these crystals that you have mixed in with that dye that change the pH of the environment very radically to a particularly temperature. 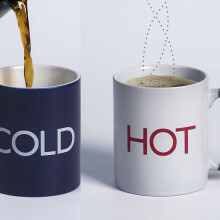 They mean that when the mug is hot, the dye is black, you can't see the picture and then as you drink your tea, you get down the mug, the mug cools down and the picture is revealed from the top as you get down your mug of tea. Hannah - That explains exactly how the mug that I have at home works like that and it's been working for years. So obviously, this particular paint keeps on going with this melting temperature pH change thing. Dominic - Yes, absolutely. You've got these crystals in there and they can change between the liquid state and the solid state, mix in with that dye many, many times and that mug will carry on changing as many times as you want it to. 25:57 - Why do my feet smell like corn chips? Why do my feet smell like corn chips? Hannah - Well, it's due to this little bacteria called Brevibacteria which are also use to ripen or mature certain types of cheeses. These Brevibacteria are found on human skin, in a normal kind of way. When they're living in excess, they release chemicals called S-methyl thioesters. You may have even noticed that when you've eaten asparagus that your wee smells funny as well and that's because of the release of similar S-methyl thioesters, which smell very pungent. So, the cheese smells cheesy because the Brevibacteria releasing S-methyl thioesters as part their normal metabolism. There's Brevibacteria on our feet too, and on our skin usually, and the hot weather at the moment is causing an outburst of this Brevibacterium - kind of a party on your feet, and they're releasing this chemical compound which smells of cheesy corn chips as Tad says. Dominic - And I guess your feet are underneath socks and shoes and so that sweat isn't drying out, so it's a perfect environment for these bacteria? It's 20 years since astronomers found the first direct evidence that many of the stars of the night sky have planets around them. But until recently, we've known very little about what these worlds might be like. Using a technique called transmission spectroscopy though, astronomers are now starting to gleam some clues about what the atmospheres of these planets are made of. Dominic Ford caught up with Catherine Huitson from the University of Exeter and as she explained the technique relies on waiting for planets to pass in front of their host stars and then studying the light that's filtered through their atmospheres. Catherine - We're using a technique called transmission spectroscopy which has been in use for about 10 years or so. So, what it does is when you see the planet pass in front of the star like the recent transit of Venus, you can actually see the starlight be filtered through the atmosphere and characteristic absorption lines of specific elements and molecules are imprinted on the filtered spectrum. So, we use that to look for different chemical species in the atmosphere of these planets. Dominic - So essentially, by seeing what colours of light are passing through and being absorbed by the atmosphere of the planet, you can start to work out what that atmosphere is made of. Catherine - Yes. That's why essentially, we know what we expect to see and then we look for absorption in these particular wavelengths that tell us whether those compounds are present in the atmosphere. Dominic - I guess, given that planets are much smaller than stars in general, the diminishment of light that you see when a planet transits a star is quite small, it must be really incredibly difficult to get a spectrum of that light that's being absorbed. Catherine - Yes, so we're looking at Jupiter-size planets. Well, we're looking at hot Jupiter, so they tend to be a little bit bigger than Jupiter, a bit puffy, and they're very close to the star, so that's why we see quite a large signal. So, that's why we're not able to look at earth-like planets yet. So, we're still developing that technique to be able to do that. So, what we're looking for is, we try to pick targets or planets which are very large which are orbiting stars which are quite small, so that the light diming when the planet goes in front of the star is large. Dominic - Because these planets are puffy as you put it, I guess there's a lot more atmosphere there to absorb light whereas the Earth's atmosphere is quite a thin layer on its surface. Catherine - Yeah, so because they're very close to the star, they get heated so that they increase their size. So, for that reason, there's features that we see are quite large. Essentially, the atmosphere is inflated. Dominic - What instruments are you using to make these measurements? Catherine - We're using the Hubble Space Telescope and we're using spectrometers from the optical to the infrared. Dominic - I guess the molecule that everyone is interested in is water because that's obviously the molecule that's needed for life. Have you found any evidence of that? Catherine - Well, we have found evidence of water as steam because these planets are so hot, so it's not going to be liquid water, but we have seen a water feature. So, that's interesting again because we have seen the feature that we expect whereas in previous planets, observations have shown that the feature is muted. It's like the planet is covered in clouds and you only see part of the feature. So, it's interesting to see that in this planet, we actually see the feature we expect, so there's a surprising diversity in the planets that we have studied so far, which is the reason we're doing this survey to try and understand whether planets are different and why. Dominic - We've also got Hannah Wakeford here from the University of Exeter. Hannah, what else do we know about the environments of these planets? Hannah W. - So, these are really strange worlds. They're actually tidally locked to their star which means that one face of the planet is continuously facing the heat, the radiation from that star. That means that the day side of that planet is really very, very hot, up to about 1,500 degrees Kelvin. What we're actually looking at through transmission spectroscopy is the limb, the kind of edge of atmosphere around the side, kind of the bridge between the day side and the night side of that planet. So, we're really also looking at the different temperature ranges that we're getting between those two. These water features that we're seeing are actually slightly cooler than what has been measured for the day side of these planets, which is another really, really interesting result, seeing how the winds, how the different environments on those planets are transporting that heat from the day side to the cold night side of them. Dominic - So, it's fascinating how much we're learning about these exoplanets beyond just their masses, their sizes. We're really starting to learn what these might be like as worlds, but these aren't very earth-like worlds. You hinted that you want to move this technique to something that's a bit more similar to our own planet. How much more difficult is that going to be? Hannah W. - Yeah, you're right. These are really not hospitable worlds. You wouldn't want to go there for a holiday. So, to move that technique forward a bit, we really need to develop the technology a lot more. But what we're doing is really kind of laying the foundation for what we understand about looking at these molecules, looking at these fingerprints. 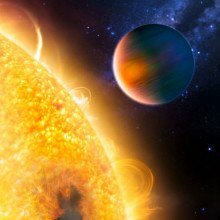 If we can understand them in something as big as these hot Jupiters where the signatures should be really very clear because the atmosphere is so extended. We can really refine the techniques right down to the point when we can confidently say when we've found these other planets and we've got better instruments to look at them, we know what that feature is. We have evidence from previous studies that we know what we're looking for and we've got it right here. Dominic - I guess the molecules that everyone is interested in are molecules like oxygen which are bio tracers of life. How far away are we from detecting those, do you think? Hannah W. - Oxygen is particularly a different one and that's difficult because of the wavelength ranges it lies in the intensity of the feature. Due to the intensity of the feature, it's quite small compared to other molecules. It's going to be quite difficult to find oxygen itself. But what we can look for is an imbalance in these atmospheres. So, where is there being CO2 or other molecules like water, where is there more methane and is there an imbalance from what we would expect from these worlds. That would kind of be indicative of something that is producing these different molecules rather than it occurring naturally in nature. Dominic - Now Catherine, you've been using the Hubble Space Telescope for these observations. I guess to move this further, are you going to have to use purpose-built observatories? Catherine - Yeah, so hopefully, James Webb will be flying soon and that will be specifically looking more in the infrared and the near infrared which is where we'd expect to see features such as water and methane. That should hopefully really take over. Dominic - Hannah, there has been talk of purpose-built observatories for looking at the spectra of planets. I'm thinking of Darwin in particular. Does it look like any of those missions are actually going to fly anytime soon? Hannah W. - So unfortunately, Darwin is dead. It's not around. We're not flying that mission, but there's always talks, there's proposals every few years where you can put forward these different telescope ideas. It's really important that we going to space for these, so that means that there's that higher cost and that higher risk with it. So yes, there are things in the works, but of course, space mission proposals are years and years in the future. It took from '84 to 2009 to get Keppler up, so watch this space. We'll definitely have something. The Gaia spacecraft, scheduled for launch by the European Space Agency this autumn, will make the most detailed map of our galaxy ever made. We have growing evidence that many of the stars of the night sky have planets circling around them, but where did the stars themselves come from? Our galaxy, the Milky Way, is a grouping of around 100 billion stars and all the brightest stars in the night sky are part of this family. But when and where did the Milky Way's stars form? The first step to answering that question is to know how they're distributed through space. Dominic Ford spoke to Lennart Lindegren from the Lund Observatory in Sweden is working on a new space telescope that will map out the galaxy. Lennart - Gaia is a satellite designed to survey about 1 billion stars in our galaxy and one of the main results from it will be distance determinations to many of these stars, so that we get the truly three dimensional map of our galaxy. David - So basically, the earth just goes around the sun once every year and our satellite is somewhere around the earth of course. By looking at nearby stars, you see they're in one position in July and then if you look at them in January, you see they've shifted to another position. If you actually do that and you can do it in nice video plots, you see that it traces out a nice oval on the sky and then the angle of that oval gives you the parallax measurement which you can convert then into a distance with a simple formula. Lennart - So, over the 5 years that Gaia will be working, the stars will be seeing to wobble back and forth by a tiny amount, depending on their distance. The nearer the star is, the bigger is this wobble. So, by measuring this small angle, we can get the distance to the stars. Dominic - So, these stars are nodding back and forth in the sky. I guess that motion must be very small, given how distant these stars are from us. Lennart - Yeah, when we show videos of this wobbling of course, we exaggerate it by a factor of 100,000 or something like that and that's the reason why you need a very highly precise satellite to do these measurements. Dominic - The technique of using the parallaxes of stars to determine their distances has a long history in Sweden and Denmark. The idea was pioneered over 400 years ago by Danish astronomer Tycho Brahe who proved that the supernova he saw in 1572 was an astronomical object rather than a weather phenomenon in the earth's atmosphere as other astronomers believed at that time. Lennart - Yes, that is right. He used that method to prove that the new star, the stella nova which was discovered in 1572 was actually further away than the moon which was a revolutionary discovery at that time. So now, we are using this method since 200 years to measure distances to stars, which is of course, much more difficult because, since the stars are more distant than the moon for example, the parallax will become very small. When we want to measure distances to stars in the other end of the galaxy for example, these stars are very, very distant. So, the parallax becomes very small and therefore, it is difficult to measure, which is why we can't do it until now. Dominic - So, Tycho was doing this with comets back 1572. When were we first able to measure the parallax of a star? Lennart - The first, really successful or convincing measurement of a stellar parallax was made by Friedrich Wilhelm Bessel in 1838. He was working in Konigsberg in Germany. He measured the distance to star number 61 in the constellation Cygnus. That was a real breakthrough in the history of astronomy because astronomers had tried to measure parallax for centuries and this was the first convincing detection of the parallax. Dominic - What's Gaia adding to that? I guess, by being in space, you haven't got the distortion of the earth's atmosphere. Lennart - Yes, that's right. That's very important. The atmosphere has been an obstacle for accurate parallax measurement until 1989 when European Space Agency launched the Hipparcos satellite which was the first satellite designed to measure parallaxes from space, and it did that very well with an accuracy of about a thousandth of an arc second. But only for about 100,000 stars and the only stars rather close to the sun. With Gaia, we want to measure many more stars and many more distant stars, and therefore, we need much more accurate measurements. David - Gaia is 100 to 1,000 times more accurate than Hipparcos, just because of the new instrumentation but the measurement principle is basically the same. If you think of Hipparcos and you plot what kind of scale Hipparcos could see for a solar type star for example on top of the galaxy then you'll see that Hipparcos could only see very locally. It's a little dot on the galaxy basically. It certainly wouldn't be much bigger than just sticking your pen on a piece of paper. But if you take Gaia then you can see that the distant scales that Gaia can probe for the same kind of star is very far out. For solar-like stars, Gaia can probably see out about 8 kiloparsecs with an accuracy of 10% to 20%. That in astrometry is considered to be very good. But then for very bright stars, Gaia can see right away across the galaxy. Dominic - We often hear about exoplanets being discovered by their gravitational pull, causing stars to wobble back and forth. I guess there are lots of other phenomena that you're having to distinguish this wobble form. David - Yeah, of course. So, what we do is we build models of how the light should enter the telescope basically. You have to take into account a great many things. Of course, the finite speed of light for example, this is known as the Roemer correction has to be put into the time measurements even. Then you have the parallax wobble as I mentioned, but also, you have the light deflection in the solar system. So, you have to have a model of general relativity which is an extremely accurate model. It must be more accurate than the final position of Gaia. So, we have to have a microarcsecond relativity model. Dominic - So, the issue there is that the bodies in the solar system bend light because of their gravitational fields. David - Yeah, sure and you have to take this into account and of course, the sun for example at 90 degrees to the sun, you're still getting 4,000 microarcsecond light bending. So, it's an enormous effect. You have to take the sun's light deflection into all measurements. You typically also want to take Jupiter's light deflection into account because Jupiter is a very large body also. You also interestingly enough have to take the Earth and the Moon into account, or you should take the Earth and the Moon because the light deflection is very weak from the Earth and the Moon, but they're very close to Gaia at already 1.5 million km away. So, you should also take that into account. And of course then the other planets also have some effect. We actually use the measurements of Gaia, we take all of the measurements of Gaia together and we try to use that to test, does Gaia tell us that Einstein is right for example. And the point about Gaia is, we have so many measurements that we think we can make the most accurate test of light deflection due to general relativity and Einstein's theory and so on possible. Dominic - Obviously, it's interesting from the point of view of natural history to make a catalogue of these distances to the stars we see in the night sky. What scientifically can we get out of that catalogue? Lennart - Well, first of all, it can give us a detailed map of the structure of our galaxy. 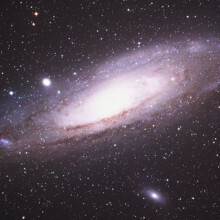 As we see it on the night sky, we only have a 2-dimensional image of the galaxy. So, getting the third dimension is very important for understanding the large scale structure of our Milky Way. But also, the individual distances to the stars are very important. To understand their physics, you need to know the distance to a star to translate the brightness on the sky to the real luminosities of the stars and get their physical properties. So, all kinds of astronomy will benefit from this information. Dominic - Is that structure telling you about how our galaxy actually formed, how it's evolved, where it's come from? Lennart - That is one of the scientific aims of Gaia to try to understand the history of our galaxy. It is thought that a big galaxy like ours is partly composed of many smaller galaxies that have been eaten up by our galaxy. They have simply fallen into our galaxy and it may be possible to identify which stars came from different in falling galaxies in the past and therefore, know a little bit of the history of how the galaxy was assembled. Dominic - Gaia is going to launch, is it November or December this year? What's happening at the moment? Lennart - At the moment, the satellite is going through the flight acceptance review which means that the engineers and scientists responsible for putting together the satellite, check that everything is in order. It appears that it is there, so it will go ahead for launch in November, December hopefully. David - Gaia is ready to go today. It just has to be shipped to South America and then is ready for launch. So, it has to be flown down in two parts - the sunshield and the spacecraft goes separately because the sunshield is so big. Then there's no storage facilities in French Guiana, so it has to it has to be more or less mounted once it gets there and so on, and be ready. An Antonov Russian airplane was booked to send it down there in July and then they were told, "No, you can't go." The problem is, there was a conflict with some GPS satellites being launched. Because of that conflict, Gaia got shoved back a little bit. So, we've been pushed back by 2 months now until November/December. There's a launch window in November/December which is more or less defined by where the moon is for example. You don't launch into the moon. So, we have certain dates where we can launch and we've now been assigned this new launch date from the 17th of November to the 5th of December. Hopefully, it will go then because the spacecraft is sitting there and all the tests are done. It's really ready to fly. People are just doing some last minute monitoring of the spacecraft at the moment. Dominic - And once it's up, how long until we start getting scientific data back from it. David - Yeah, well the first thing, it has to be sent into a transfer orbit to the L2 Lagrange Point which is 1.5 million km away from the earth. As it is flying out, the sunshield will be opened. The spacecraft is cooling terminally. So, once the sunshield is open, it can actually take measurements, but those measurements would be probably quite poor to begin with because the terminal cooling of the spacecraft takes a month or so. 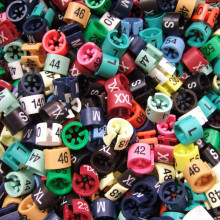 Also, the transfer journey takes a month or so, but people will actually start taking measurements because the sooner you get something even though it's very inaccurate, you can start testing your data reduction scheme with it. Dominic - When can we expect the first scientific results to come out from that? Lennart - Some preliminary results will come already about 2 years after the launch, but that will not be very accurate. So, as it accumulates more data and they are processed, we will have successively more accurate results and the final results which is what all the astronomers are hoping for will come around 2021. So, that is a long time to wait. By dating stars and looking at how they're moving, astronomers are trying to work out where the stars of the Milky Way came from. Sofia Feltzing works on surveys with ground base telescopes which will complement the data which comes back from Gaia. She is hoping to combine the best possible estimates of how old stars are with maps of where they are in the galaxy and how they're moving to look for grouping of stars that may have a common origin. She told Dominic Ford that while Gaia is very good at measuring how fast stars are moving across the sky, it's not so good at telling us whether stars are moving towards or away from us. Sofia - So, in order to see how the stars are actually moving in the galaxy in 3D, not just on the sky, we need that third dimension of the velocity. We can do that from the ground very well. Radial velocities today can detect planets very, very accurately circling around other the stars and the precision there is enormous. So, the requirements are easily met by ground base telescopes and instrumentation that already exists today. However, even if the technology is there, the type of spectrograph you need is not there. You need to be able to take a thousand spectra in one go or maybe up to 3,000, covering several square degrees on the sky. So, several moons in one go. You can do that by building new spectrographs. Dominic - So, you're looking at these spectra and you're working out how fast the star is moving along the line of sight by looking for spectral features which have been red shifted. Sofia - That's correct and we don't call it red shifted while we're looking at stars. We just say that they are shifted in the velocity. I mean, we always talk about red shift because it's the galaxies are moving away from us, but the star could be moving towards you. In the universe, the galaxies are moving apart, but in the galaxy, things are moving in many different ways. So, you have a set of spectral features that you will measure how much they changed relative to the lab wavelength. Dominic - Once you've got this huge catalogue of stars around the sun and how they're moving, what scientifically can you learn from that catalogue? Sofia - So, the important thing is not just around the sun we're looking anymore. That was the Hipparcos satellite. The Hipparcos satellite is looking - I mean, dwarf stars like the solar-like stars is only within 100 parsecs of the sun. Now, Gaia will see sun-like stars 20 times or more further away with equally good precision. So, a so-called G dwarf star like the sun will still be very bright and Gaia terms when it is 2,000 parsecs away which is a quarter off the distance to the galactic centre from us. So, we can see stars like the sun, almost into the galactic centre, knowing where they are in the sky and how they move. But this is not the only thing we can get from spectra. So basically, what you do is you're splitting the light from the star up into its wavelength, just like putting a prism in front of a sunbeam and you'll see all the colours. It's what we do in a spectrograph, but you can do this with very high resolution so that the smallest elements you're looking at is really a tiny little bit of an angstrom. Perhaps you've seen out from the sun, if you split up the light in the rainbow of colours, there are dark areas in there, dark lines across. Those are absorption lines in the solar spectrum because there are elements like iron, oxygen, and carbon in the outer atmosphere of the star. Each element has its unique fingerprint of such absorption lines. From these absorption lines, we can calculate how much there is of a given element in a star. The beauty of the dwarf stars, the solar-like star is that they live for a very long time and nothing much happens to them. They're dead boring. For people who like to study how stars behave and how they evolve and things, these stars are not very exciting. They are really actually quite dull. But they're very good because nothing happens in their outer atmospheres at all. I mean, there's nuclear burning going in the centre but you don't notice it on the surface most of the time. And therefore, if you can measure how much iron, oxygen, carbon, chromium, and titanium there is in the outer atmosphere of this star, you have a fair sample of the composition of the gas that this star formed out of. Dominic - I guess something you really want to know though is how old those stars are and it must be quite difficult to date them if they're not changing very much. Sofia - Right. So yes, there are many ways of dating stars, but it all has to do with us understanding how stars evolve. These stars are deemed rather good because there is clear signatures when you put them in certain diagrams; when we have the stellar evolutionary model and the temperature, and the mass of the star for example, you can see how old it is. There can be fairly in large errors on them, it depends really a lot on the exact star. Stars like the sun can be dated within say, a billion years and the universe is 13 billion years and the oldest stars we find are at least 10 billion years or something like that. Now, there are more evolved stars, so-called red giants which you can date very well and there are two satellites, Kuru and Kepler who were studying very small pieces of the sky, not like Gaia who's going to study the whole sky. They are studying particular regions, but they get very good astro seismology data. So, they will be able to age data stars very, very accurately and combining those data with the Gaia data, they will also put very strong constraints on the stellar evolutionary models. But we would be happy with very large samples of stars that we can age date within a billion years because then we can see how the larger properties of the galaxy vary as a function of the distance from the galactic centre. Not anymore looking at things just near the sun, but how things vary at a distance from the galactic centre. Dominic - Once you've got this catalogue of where the stars are, how they're moving and what types of star they are, I guess that's telling you about the history of the Milky Way when these stars were forming and where. Sofia - So, the idea is that all of these are bits of a kind of jigsaw puzzle that you're trying to put together. It's a little bit like archaeology where you're getting pieces of a vase up and you dust them off and you find that they fit together. There might be bits that are missing, but then you can guess what they would look like. So in the past, you see, it has been often like, people work on dynamics of the Milky Way or the stars, how they move and why they move like they do, or their ages and their elemental abundances. But we will really truly need to combine this much more and even if we know what it looks like very close to the sun, within a few hundred light years, and we know a little bit of what it looks like in the centre of the galaxy, and out in the halo, we know very little of what is in between and actually, Gaia is going to help. When it comes to galactic chemical evolution or galactic evolution, a lot of what we have been inferring has historically been gleaned just from the solar neighbourhood which is a tiny, tiny piece of the Milky Way and does it really tell us about the global properties. Now, when it comes to all these ground based follow up, we would need - as I said - to build new instruments. Although there are instruments that already can do some of it. So with around 300 other astronomers in Europe, I am part of a project called the Gaia ESO survey. So, it's Gaia for Gaia and ESO for European Southern Observatory, which owns and runs in collaborations of 15 different countries, the Paranal La Silla in Chile and the Alma observatory. There, we are using the flames spectrograph that takes about 100 plus spectra of stars in one go. It's not perfect for this purpose, but it's pretty good. It's looking at a rather small piece of the sky, so we would like something with a bigger field of view and therefore, the proposal is and ESO has actually accepted to go forward with this proposal to build a completely new machine to measure several thousands of spectra in one go. This is called Foremost and is planned to go on the Vista survey telescope. Right now, Gaia ESO survey is running. We are aiming 100,000 stars and we already have been observing for a year and a half now and it's going well. We are getting the data analysis under way and starting to write the first papers. 55:35 - Does dark matter form dark planets? Why does dark matter form into haloes around galaxies, but not collapse to form stars? Does dark matter form dark planets? Andrew - There's quite a lot to unpack in this question, the first thing to say is that dark matter is this substance that we're pretty sure is out there, shaping the visible contents of the universe, but the dark matter itself is invisible. So, we can't see directly what it does. Now, the question itself is getting at the idea of gravitational collapse which is a critical part of the way that we think the universe has evolved and familiar objects within it were born. Actually, dark matter does undergo gravitational collapse, so you can take an initially large volume of dark matter and shrink it down to something smaller, just because of the gravity of the dark matter itself. But the assumptions behind the dark matter tell us that unlike in the case where you have normal gas, the dark matter particles can't get rid of their energy, they you continue flying around at very high speeds. Although dark matter particles don't actually feel pressure in quite the same way that normal matter would, you can imagine they just moving so fast that they can't be concentrated into a small volume. If you tried packing them into a small box, they'd be moving so fast, they'll just fly straight out again. So, there's actually a limit to how small you can make a cloud of dark matter. You can't make dark matter collapse into a black hole for instance because you just can't get rid of the energy to make it that small. We actually think that typical clouds of dark matter are just the right size to be lurking around galaxies in what we call a dark matter halo. Next Do dark matter planets exist?